I grew up watching all the adaptations of Jane Austen’s novels with my sisters and so I have always been familiar with Sense and Sensibility. As much as I love this story and its film adaptations, especially the BBC miniseries, this year is the first year I actually read the book. And the timing could not have been more perfect. The more I read of Austen, the more I am convinced it is not the intricate inner workings of female emotions she understands as much as it is the complexities of men’s emotions, personalities, and influences. The Dashwood sisters, Elinor and Marianne, provide us with two extreme stereotypes of the female nature. Elinor is reserved and sensible in all of her decisions and emotions, whereas Marianne wears her heart on her sleeve and always impulsively acts upon her feelings. I have difficulty identifying myself with one or the other, just as I have difficulty identifying myself as an extrovert or an introvert. Few women are one extreme or the other and yet we both relate to each sister on some level. I know what it is to feel as Marianne feels and to blindly act on my feelings instead of deliberating all of my actions with common sense. But I also know Elinor’s reserve because as emotional and outward as I can be, I do not wear my heart on my sleeve and the deeper my emotions the more careful and hesitant I am to share them. On the other hand, I have known women who are far more shy and reserved than I who have far greater difficulty concealing their emotions than I might. And then I know women who have little feeling to hide at all. Needless to say, Elinor and Marianne are two stereotypical rather uncomplicated personalities. Their male counterparts, on the other hand, are far more complex and allusive. Marianne’s greatest disadvantage when she has her heart broken by Willoughby is her simplicity, her straightforward uncomplicated reasoning that is apt to trust her feelings and justify all of her actions and feelings because they are all sincere. I do not doubt Marianne’s feelings were sincere, but unfortunately Willoughby was not worthy to know them or receive them. Willoughby’s actions, words, and feelings toward Marianne were nonetheless sincere, but that still does not mean he was worthy of Marianne’s trust and love or anyone’s, for that matter. Willoughby is a tragic character. He is a man many naïve young women unknowingly fall for. And he is a man every woman will no doubt encounter at one point or another. At the close of the story, I feel sorrier for Willoughby than I do for Marianne. He suffered the greater loss because he proved the weaker character. I believe he sincerely loved Marianne and yet he was too easily influenced by the world, by his society and circumstances. Yet he was not entirely the victim. Even Marianne, who is so ready to forgive him and justify his actions, must admit that whatever he might have heard about her that could have changed his mind, he could have fought for her, he could have, at the very least, given her a chance to justify herself. I love the scene in the BBC adaptation when Elinor confronts Willoughby and he tries to make her feel sorry for him, because after all, circumstances have kept him from the woman he loves. He has nothing. He must marry wealth. We can give Willoughby the benefit of the doubt. Maybe he momentarily convinced himself that he could make a change for Marianne and become a better man, maybe he intended to leave his past behind him. But he didn't follow through whatever his intentions might have been, so we don’t feel sorry for Willoughby. As sincere, kind, good-hearted as Willoughby may be, ultimately he is weak and cruel. If he was not prepared to fight for Marianne, he should have never fallen in love with her. He should have removed himself from her from the very beginning instead of giving her hope, taking advantage of her goodwill, her naïve nature, and her predisposition to believe better of him than he deserved. In the end, the loss is Willoughby’s. He could have been a better man. He could have been everything Marianne believed he was. He could have had a life with someone he loved. But instead he was weak. He was Willoughby. 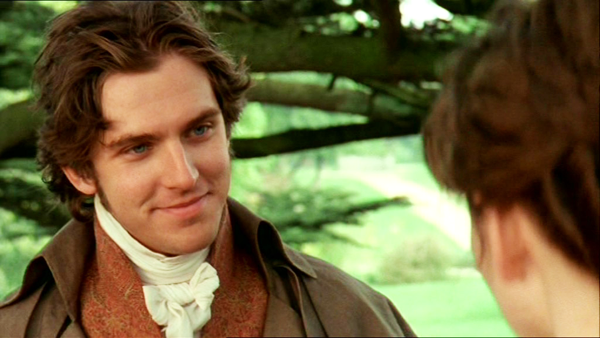 Then we have Edward Ferrars, the man who is what I like to call the anti-Willoughby. He is a man who made a similar mistake as Willoughby in his foolish youth and yet he maintained his honor and goodness instead of spiraling down the slippery slope. The circumstances are different and perhaps Edward’s original feelings toward his fiancée were not as sincere as Willoughby’s feelings toward Marianne. Even though Edward is not prepared to love his fiancée, he is still honorable enough to follow through on his commitment, even if it was foolishly and hastily made in his youth. He is the blameless man, the man who “swears to his own hurt and does not change” (Psalm 15:4b). In today’s culture, Edward’s actions are astounding. Heaven forbid that you should follow through on your word even though you feel differently about your decision later! But Edward’s honor pays off and he is released from his promise, as you all know, and made free to love Elinor and live the humble clergy life he dreams of. Have you ever read or watched Sense and Sensibility? What are your thoughts on Willoughby and Edward? Do you identify more with Elinor or Marianne? This maybe my favorite Austen book! I've always sympathized with Elinor very much and Colonel Brandon is my all time favorite JA hero. Despite the fact that I have read the book several times and watched many video adaptions I had never noticed the similarities between Willoughby and Edward. I think you are right though, Edward is the principled version of Willoughby. I have however, always thought it was wrong of Edward to let his feelings for Elinor be so obvious--All while engaged to another woman. Yes he was faithful in keeping his word to marry (what was her name anyway? Lucy?) but meantime he was letting his heart wonder and if we are honest, leading a good woman on in such a way that he eventually broke her heart. I admit that he was mostly a sweet and upright person but I've always thought Elinor deserved someone who took better care of her heart. This was an interesting study of characters from S&S! The point you brought up about the similarity between Willoughby and Edward's situations. One acted selfishly and the other honorably. Paige, I can definitely see the Elinor similarities! Have you ever seen the BBC adaptation of Sense and Sensibility? The one made in 2008? I felt for Willoughby too because he was too shallow to realize how his decisions ultimately hurt him more than anyone else. He settled for less in the end. Thanks for stopping by, Micaiah! It has been a very long time since I read this book (and by long time I mean middle school), but I vividly remember how much it resonated with me. It was pure poetry throughout. And may I just say, I love your writing style and the way your words flow. I can't say I ever felt super bad for Willoughby, mainly because of what he did to Brandon's adopted daughter. He abandoned Marianne because he couldn't face poverty, which is somewhat understandable, but there was no reason for what he did to 15-year-old Eliza. Agreed! I think this truth helps Marianne begin to start to recover because she realizes she has made an escape. "He is a man who made a similar as Willoughby..."